Garbage Disposal Repair/Replacement - The garbage disposal is a common household device installed under a kitchen sink between the sink's drain and trap. 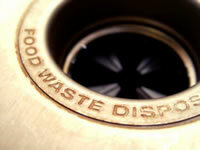 Garbage disposals are designed to shred food waste into pieces small enough to pass through standard plumbing and residential plumbing pipes. From time to time, this device may jam or break altogether if very hard or bulky objects are accidentally or deliberately introduced. Even more problematic are drain blockages caused by shredded waste which is very fibrous (artichoke leaves, or many other vegetables byproducts) or starchy (potato peelings). Same Day Drains specializes in drain cleaning, plumbing repairs, repairing or replacing under sink drain lines and garbage disposals, so contact us today if you are experiencing garbage disposal blockages or problems.